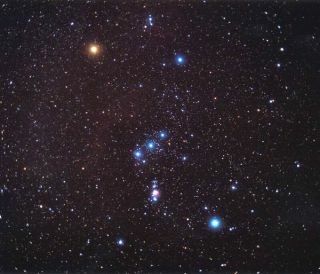 A view of the constellation Orion. A small town in Illinois has become the world's third International Dark Sky Community, a place that aims to protect the quality of its dark, star-filled night sky by controlling the amount of outdoor lighting. The town of Homer Glen was designated an International Dark Sky Community on Nov. 21. The town is located 30 miles (48 kilometers) southwest of Chicago, and residents there have worked hard to promote the dark sky movement by raising awareness about the negative effects of light pollution from wasteful outdoor lighting. The International Dark-Sky Association is a U.S.-based non-profit organization that was founded in 1988 to champion the dark sky movement. A primary goal of the organization's International Dark Sky Places program is to preserve the quality of dark skies around the world, which are valuable assets to astronomers and skywatchers. Homer Glen's proximity to Chicago prompted officials to start education campaigns for smart lighting policy. Excessive outdoor lighting can cause what is known as sky glow above the horizon, which can reduce the quality of astronomical observations. A group of citizens from Homer Glen started an advocacy group called the Illinois Coalition for Responsible Outdoor Lighting. Their efforts resulted in the 2010 adoption of a statewide resolution condoning responsible outdoor lighting. But the dark sky movement is about more than just astronomy. The initiative is aimed at raising awareness of other negative effects of light pollution, including energy, health and ecological concerns. In a ceremony in 2008 hosted by the International Dark-Sky Association and the World Wildlife Fund (WWF), then-Lieutenant Governor of Illinois Pat Quinn praised Homer Glen for its "environmentally friendly" outdoor lighting policies and its promotion of Earth Hour, which is an annual global event organized by the WWF that encourages people to turn off lights and appliances for one hour to raise awareness about climate change. "Homer Glen's dark sky ordinance conserves energy, protects wildlife, and reminds all of us of the natural beauty of a starry night," Quinn said in a statement. Flagstaff, Ariz. was the first city to earn the International Dark Sky Community title, followed by Borrego Springs, Calif.